Known as Féve in French, Garten-Bohnen in German, Valske Bonner in Danish, and Hava in Spanish, the Fava Bean has been cultivated for centuries and is still considered a staple of the Mediterranean diet. Also known in English as the Broad Bean or Horse Bean, it was the only bean known to Europe before contact with the new world. Remnants of favas have been found in archeological sites and medieval peasants made a purée of favas seasoned with a bit of salt pork. There is also a fava bean with tiny seeds used in Middle Eastern and North African cooking, called Ful Madamas—usually they are used as a dry bean. 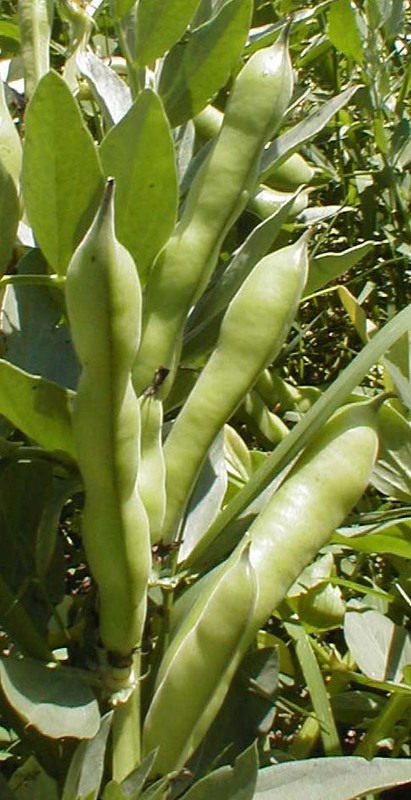 The fava resembles such shelled beans as limas and butterbeans, but it is actually more closely related to the pea family. Although available in their dried form, fresh favas are very difficult to find in supermarkets—farmers markets are the most dependable source for the freshest beans. Many farmers plant a small-seeded variety of favas as a winter cover crop because they are very cold hardy, and because (like peas and beans) they are a legume and have the ability to fix nitrogen in the soil. First, you’ll need to shuck the beans. Snap off the stem end of the pod and pull away the tough string on the side. Break open the pod with your thumbs and strip out the beans inside. If the shelled beans are large or old, they may have a skin surrounding them-to remove the skin, drop them in boiling water for one minute, then drop them into cold water. Use a thumbnail to open the skin, take aim, and squeeze the bright green beans out with your fingers. Try younger beans as a snack or appetizer raw with coarse salt and good olive oil. Maturing beans become starchier as they age and require progressively longer cooking times. Starchier beans are good mashed into a paste with garlic and herbs and spread on toast, or as a pasta filling. Younger ones are fine sautéed either on their own or with other vegetables, with a little garlic in olive oil. 2. Bring a pot of water to a boil, add the favas, and simmer for 1 minute. Drain and cool them immediately in cold water. Pierce the outer skin with a thumbnail and squeeze each bean out of its skin with thumb and forefinger. Peel and chop the garlic very fine. Strip the rosemary leaves off the sprig and chop very fine. 3. Put the fava beans in a saucepan with a mixure of half water and half olive oil, enough to barely cover them. Add the garlic and rosemary, and season with salt and pepper. Bring to a simmer, cover, and cook until the beans are tender, about 5 minutes, more or less, depending on the beans. Finish with a squeeze of lemon juice and another grind or two of pepper and serve. If the fava beans are young and tender, you may omit step 2—no need to peel the outer skin from the individual shelled beans. Beans cooked this way are delicious with pasta—toss or serve on the side. Warm 1/4 to 1/2 cup of good olive oil in a shallow pan, and add a few cloves of minced garlic with some shelled fava beans and a touch of salt and a sprig each of rosemary and thyme, and a splash of water. Simmer about 30 minutes and mash or purée. Add a few drops lemon juice, and as much olive oil as needed to make it spreadable. Serve warm, alone or on grilled bread. 2. Arrange the garlic in the bottom of a small baking dish appropriate to bring to the table. Surround with the favas and cover with the rosemary. Drizzle the olive oil evenly over the vegetables. 3. Cover and bake for 40 minutes, or until the garlic is tender. Season with salt and pepper, moisten with additional olive oil, and serve. I made a great saute out of the fava beans in last weeks (8/3) share! I started with chopped bacon and chopped onions (also from the 8/3 share). I heated the onion and bacon til it started to crisp, then added in the beans, lemon basil (yep, also in that share) and a LOT of garlic. I added a splash of red wine, somewhere between 1/4 and 1/3 of a cup, and let it all bubble together til the beans were tender. It was so good–the whole family liked it, and we find ourselves hoping there will be more favas in the weeks to come!